We took experience the strength of Advertisements in parliamentary elections of India. Advertising agency made creative advertisements in newspaper, television and social media. Print ads, Newspaper Ads and video films plays major roll. 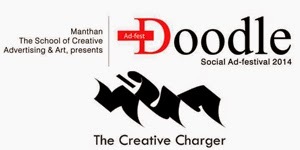 Doodle Social Ad Festival started by Mr. Shashikant Gavli, founder of the School of Creative Advertising for develops creative advertising skill of middle class people. Advertising Techniques, Advertising Ideas, Creative Visualization etc. courses are taught in their Manthan Arts School. Too many people are making creative print ads in community. To reach other people their advertisements, for getting them job in best advertising agency, Doodle Fest started for these grand purposes. Thousands of people sending their entry for Doodle Social Fest in the category like print ads, video films. Inauguration and Prize distribution is done by famous peoples. When days reducing for the doodle fest then Increases curiosity about that and reverse countdown started. Shashikant Gavli sir uses their advertising techniques and creates new advertisements of reverse countdown. Not only creativity is available in those advertisements but also have a separate social massage in each day. Let’s see how those ads are that helping us to develop our design skill for making creative advertisements. Social Message :80% of students are willing to donate their eyes in India.Donate Eyes! Social Message :6 don't call them by number. Call them by nameTreat Them Equally! Social Message : 1.5 million children die every year due to hunger.End Malnourishment! Social Message : 0 is not end, but a new beginning.Stop Comparing your Child's Academic Performance.